Representative Grayson is correct that the New York Fed overstepped their bounds by law when they took on a bunch of junk grade loans on their books. We have a Federal Reserve System which was created to create independence from our politicians so we would not be tempted to print money without bounds and debauch our way of life through inflation. In the same sense, our Fed is not suppose help out bad banks and purchase their toxic loans and give them good U.S. dollars for them. The Fed should be the lender of last resort and that is only in the case if there is a panic and you as a bank have good collateral and you need help to weather the storm. This did not happen during the financial crisis of 2008. They purchased knowingly bad loans to increase profits (aka: greed) and they should pay the price for those actions. Don’t let the bad money / banks chase out the good. We need to reward prudence and foresight and punish greed and ignorance. These are bankers we are talking about, they should be our more astute professionals in the financial world and they should know the risks and bare the pain for their choices no matter what. PERIOD. 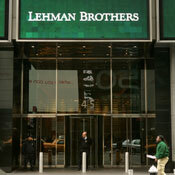 Huffington Post – As Lehman Brothers careened toward bankruptcy in 2008, the New York Federal Reserve Bank came to its rescue, sopping up junk loans that the investment bank couldn’t sell in the market, according to a report from court-appointed examiner Anton R. Valukas. The New York Fed, under the direction of now-Treasury Secretary Tim Geithner, knowingly allowed itself to be used as a “warehouse” for junk loans, the report says, even though Fed guidelines say it can only accept investment grade bonds. Meanwhile, the Fed and Geithner both strongly oppose a congressional measure to authorize an independent audit of the central bank and its lending facilities. The provision passed the House but is under attack in the Senate, where Banking Committee Chairman Chris Dodd (D-Conn.) says he hopes to stop it. Without an audit, the Fed is able to conceal the specifics of what it holds on its balance sheet. If the Lehman deal is any indication, the Fed is hiding billions of dollars in toxic loans on its books. “The Fed legally is forbidden from taking such assets. There’s a legal requirement that the Fed’s assets be investment grade,” Rep. Alan Grayson (D-Fla.) told HuffPost. Grayson, who is the cosponsor of the Grayson-Paul Audit the Fed measure that passed the House, said the Lehman scandal shows precisely why such an audit is needed. Now we are getting more information on the OTC derivative market and the different liabilities that the different players had with their counter-parties. The more I am reading about these products (got a nice book on the subject that was written in 1993) and the more I read the more derivatives sound like insurance. You know what that means? It means they should be regulated like an insurance product and that means the companies issuing this insurance needs strict capital requirements and their capital can only be invested in the safest financial instruments which we used to call “AAA” before the quality rating became a backroom Wall Street joke. No doubt everyone looking back will think that Lehman should of been saved from their current fate but that is now in the past and we have to deal with the current situation. I think some hard questions will need to be answered when we look early in this meltdown on why certain companies were saved when others were not even days apart? I am suprised no real criminal investigation have really been announced other than Madoff. Lehman Brothers Holdings Inc’s emergency bankruptcy filing wiped out as much as $75 billion of potential value for creditors, The Wall Street Journal reported on Monday, citing an analysis by the bank’s restructuring advisers. A more planned and orderly filing would have allowed Lehman to sell some assets outside of bankruptcy court protection and would have given it time to unwind derivatives positions, according to the analysis by Alvarez & Marsal. A domino has now been tipped. This has serious implications for counter-parties who were backing Lehman’s debt and now are going to cover these obligations and make them good. We will see negative effects if companies can not payout. That will not help us get more confidence into the market. Sellers of insurance on bonds issued by bankrupt Lehman Brothers Holdings Inc. are now likely to face demands that they pay out more than 91 cents on the dollar to buyers of those insurance contracts. That’s the upshot of an unusual auction process Friday that established the price for defaulted Lehman debt, and in turn potential claims payouts on insurance protecting that debt, known as credit default swaps. This is interesting. It looks as these proceedings take place, more details and facts are coming out to see how the collapse of these major financial institutions took place in such a quick fashion. Lehman Brothers’ creditors claimed that JPMorgan had $17 billion dollars of their asset in safekeeping when they had the “freeze” and then subsequent takeover. Lehman Brothers Holdings Inc.’s main lender and clearing agent, JPMorgan Chase & Co., caused the liquidity crisis that led to Lehman’s collapse, creditors said.